Jamaica's Cockpit Country is one of the richest and most underexplored regions of the Caribbean Biodiversity Hotspot. It is a limestone plateau that has been eroded into a patchwork of conic hills and depressions. The region is known for its rugged terrain and its diverse plant and animal life. The unique topography of Cockpit Country, often compared to the shape an egg carton, is notoriously difficult to explore. It is easy to become disoriented among the peaks and valleys that all appear identical. Hiking the steep slopes and sinkholes can be treacherous. Botanists have explored just 25% of the hilltops, but their discoveries in the region have been astonishing. Approximately 1,600 native plant species have been found, including 106 species that exist nowhere else. 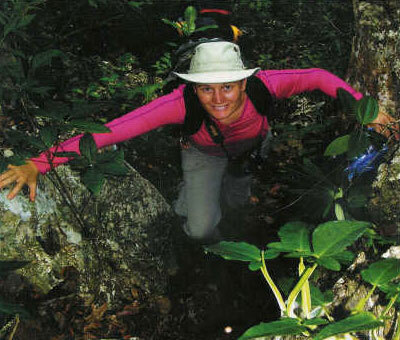 It is likely that there are many additional plant species waiting to be discovered in the vast unexplored areas. Development and deforestation are having a major impact on the native habitats of Cockpit Country. Many of the plants are threatened with extinction, but there are 17 species of particular concern. These are called the “lost species” of Cockpit Country, because scientists are not certain that they still exist. All 17 have only been found once in a single location, and some have not been seen in decades. Fairchild and its partner organizations are exploring Cockpit Country to learn the fate of the region's lost species and to find ways to conserve the unique habitat. Explore Cockpit Country using historical data, modern maps, and GPS technology in search of the region's lost species and species that are new to science. Document the plant diversity of Cockpit Country by collecting herbarium specimens and locality data. Assess the status of the native forests of Cockpit Country and make recommendations for conserving the region's flora. 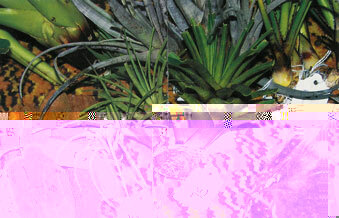 Establish a nursery at the Windsor Research Centre for propagating and conserving the threatened plants of Cockpit Country. 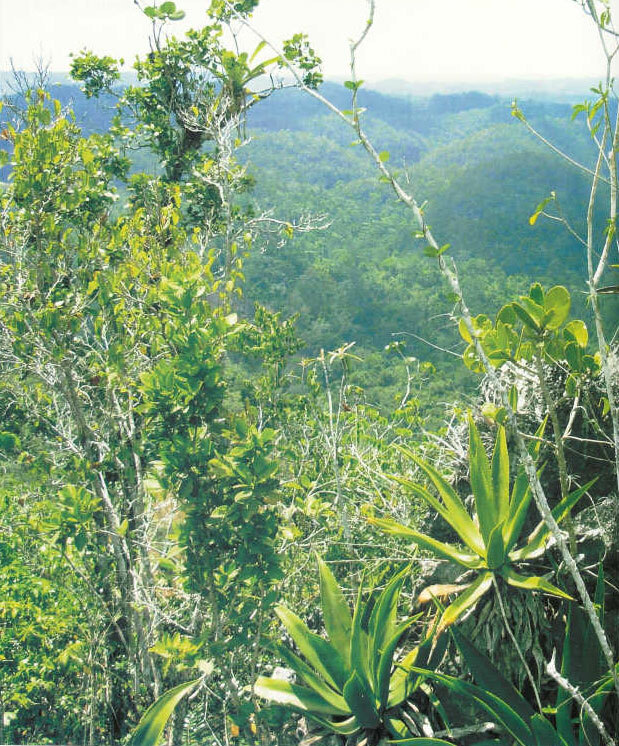 Part of the Caribbean Biodiversity Hotspot and recognized by the World Conservation Union (IUCN) as a Center for Plant Diversity, Cockpit Country is largely under-explored due to its rugged terrain. The Fairchild team collaborated with the University of West Indies-Mona (UWI), the Forestry Department of Jamaiica, the Institute of Jamaica (IOJ) ahd the Windsor Research Centre in their exploration. “This is an exciting project for Fairchild,” said Lauren Raz, Curator of the Herbarium at Fairchild Tropical Botanic Garden. As we searched for the lost species, we documented plant diversity in areas rarely or never explored before. We also worked with local agencies to develop horticultural capacity in Jamaica, so that native plants can be propagated for plant consetvation projects in the region. Long-term conservation goals include: restoring native forests in areas that have been degraded, protecting existing forests and conserving all endemic tree and plant species. The first phase of the expedition involved capacity building for the Windsor Research Centre, a remote field station established to monitor and centralize research associated with the Cockpit Country. The Director of Windsor, Michael Schwartz, constructed a plant drier using specifications sent by Fairchild staff. This drier proved worthy - it dried over 600 herbarium vouchers during the expedition. 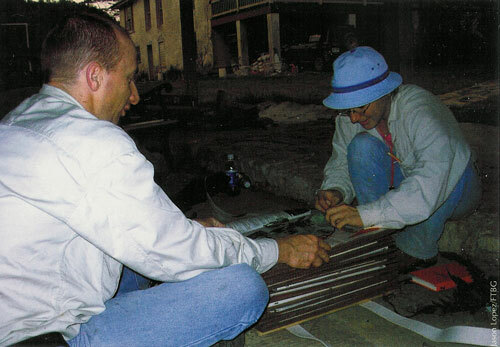 Fairchild also sent materials to construct a rudimentary nursery. Ken Neugent, Fairchild's Nursery Manager, and Christie Jones, Curator of Palms and Cycads, spearheaded this effort. With the help of Windsor staff and local youths, a shade house with a working irrigation system and mist bench was built. This nursery is the first in the Cockpit region, and it will be used to propagate native plants for restoration projects. One of those projects involves experimental plots at Linton Park Mountain, a degraded area that will be replanted with native species and will provide economic benefits for local people. Jamie Gordon, Fairchild's Caribbean Plant Conservation Scientist, put his forestry experience to great use on this restoration project. Phase two of the expedition was the exploration of the Cockpit. The Fairchild team expanded to include Raz, Jason Lopez, Rainforest and Horticultural Exbibits Manager, and Michael Davenport, Director of Horticulture. Initially, the team was joined by Patrick Lewis, Keeper of the Herbarium at UWI, Keron Campbell, Assistant Botanist at IOJ, and Lawrence Nelson, Director of Research at the Forestry Department. This remarkable team began it's search for lost species by visiting many of the places that the species was last seen, sometimes over 30 years ago. Results were mixed since some of the sites were so degraded that very little native vegetation remained. It soon became clear that the sites in the worst shape were near roads where access was easy. So the team looked upward. The Cockpit Country is unique in its topography. Steep limestone hills thrust upward throughout the region, reminding more than one observer of an upside-down egg carton. Altbough many of the hills seem identical from low ground, each hilltop has its own character, and the plants vary greatly from hill to hill. It is estimated that less than 25% of the hilltops have been explored, so the team climbed steep slopes whenever possible to reach the summits. In such rugged country, it is necessary to have knowledgeable guides, and the team found two great ones among Windsor's staff, Ruffy (Raymond Lewis) and Hoggy (Wayne Francis). Both Ruffy and Hoggy had climbed the hills since they were children and found many paths that the team would have overlooked. On the hills where there were no paths,the team scrambled up the slopes as best they could, being careful not to grab the poisonous Maiden Plum, a small tree that offers an inviting handhold. We collected specimens as we traveled. Hoggy proved to be a great tree climber, which saved a lot of time. 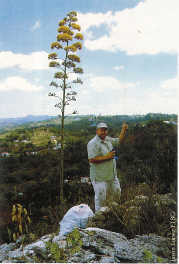 On the hilltops we were rewarded with stunning views and a profusion of flowering plants: orchids, bromeliads, euphorbias and agaves. The dominant palm was Thrinax parviflora, the Thatch Pole Palm, a tough customer that grew directly out of the rock. Years ago, Robert Read, a Fairchild scientist, had explored these same hills while working on his monograph of the genus Thrinax . We were very aware of past explorations in the Cockpit since Dr. George Proctor, the grandfather of Jamaican botany, joined us for a few days. Dr. Proctor left Massachusetts in the 1940s to work on ferns in Jamaica, and he never left the Caribbean. A longtime researcher with IOJ, Dr. Proctor botanized on almost all of the Caribbean islands, and along with Mr. Read, helped write C. D. Adams' Flowering Plants of Jamaica, the standard work on Jamaican flora. We brought this book up every hill and consulted it frequently. Although Dr. Proctor's eyesight is faiing his memory is strong. As we drove along the rough backroads of the Cockpit, he would holler at the driver to stop and climb up the closest hill. “That's where I first collected the Mammillaria,” he would say. “Go see if it is still there.” All too often, the plant could not be found — a result of poaching, logging or agriculture. Yam growing is a big part of the culture in the Cockpit region. Farmers cut down sapling trees to make yam poles, so the forest does not regenerate. The locals heard about a government program to replace yam poles with plastic stakes, but so far, none have been distributed in the region. Perhaps this simple solution can help conserve these irreplaceable forests. There are many parts of the Cockpit, however, far from road or trail, that are untouched. The team felt confident that continued work on the unexplored hllls would result in finding almost all of the lost species. We did find many Jamaican endemic p1ants. For every site that was damaged, there was another one intact. With Dr. Proctor's help and the other Jamaican botanists, it was easy to identify plant materia. By the end of the trip, we confirmed the discovery of three of the lost species. Herbarium work may show that two other collections were also lost species. We were fortunate to find a plant new to scierice, a Pilea. This groundcover was growing in a dry spot near a roadside, a tough little plant that has great horticultural potential. We found it covered in red flowers, but it had not set fruit yet. Fortunately, Fairchild will be back in Jamaica later this summer to look for that fruit, search for more lost species and document the true diversity of this rugged land. 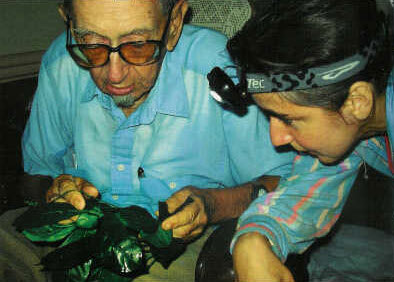 With Dr. Proctor's help, Fairchild will also develop a checklist of the Cockpit plants, a resource that wil help conservationists and biologists for years to come. 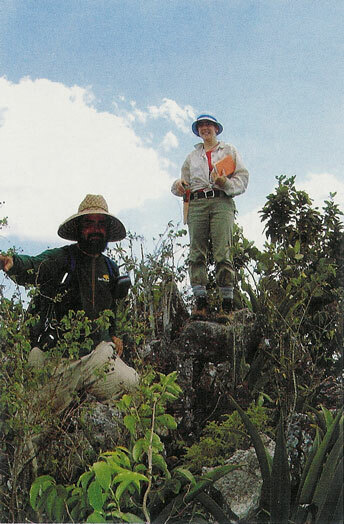 Dr. Lauren Raz and local field guide Steven Palmer collect plants. Think of Jamaica and you may think of white sandy beaches, reggae music and Appleton Rum. For the botanist, however, this small Caribbean island conjures images of rugged limestbhe hills, rural landscapes and plant diversity on a titanic scale. Jamaica is home to an estimated 3,000 species of flowering plants, of which about 30 percent are endemic (found nowhere else on earth), all packed into a total area of only 4,400 square miles. Compare that with Florida, where about 4,000 plant species are spread out over nearly 66,000 square miles. Over the past year, Fairchild has been engaged in botanical exploration in Jamaica in a remote region called the Cockpit Country; about 500 square miles located in the western part of the island, comprising most of Trelawny Parish. This limestone plateau was lifted out of the sea millions of years ago, and eroded over time to form a series of peaks and valleys. The unusual name refers to the regions unique geology — the valleys, called cockpit bottoms, are said to resemble the pits in which cockfights were staged. The plateau itself stands at about 2,100 feet at its southern end and slopes down to the north, where it rises about 1,500 feet. The limestone hills are evenly dispersed throughout. They harbor elaborate cave systems, and collectively form the largest watershed in Jamaica, providing freshwater to five of the island's parishes, as well as supplying drinking water to most of the cruise liners that pass through the Caribbean. “Water is Jamaica's oil,” says Charles MacKenzie, inspector for Jamaica's National Environmental Planning Agency, and a passionate defender of the Cockpit Country. This watershed is also home to 27 endemic bird species, numerous species of land snails, frogs and reptiles. To date, more than 1,000 plant species — including 64 endemics — have been documented from the Cockpit Country. 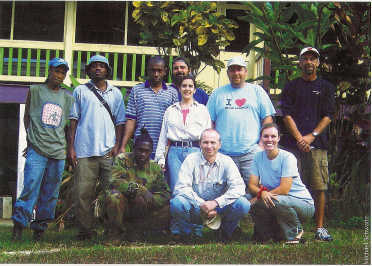 From Aug. 6 - 26, 2006, a team of Fairchild researchers and horticulturists returned to Jamaica's Cockpit Country to resume our search for the Lost Species. These are rare, endemic plants known from only one or a few localities in the Cockpit Country that have not been seen for between 30 - 100 years. In some respects, our mission is like the search for the ivory billed woodpecker, but unlike that notorious bird, these species do not have armies of amateur naturalists out searching for them. For every ivory billed woodpecker, there are hundreds of plant species that will quietly go extinct in relative obscurity. 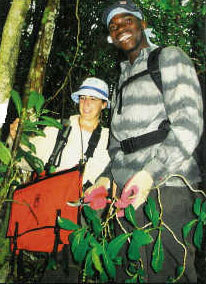 In Jamaica's Cockpit Country, we were attempting to track down 17 Lost Species (see box). Our list also included three poorly known species, new to science (an Ahthurium and a Cinnamodendron), but thus far known only from vegetative material. Our aim was to collect flowering, fruiting material, or both, so that these species could be described. Heather Jacobsen climbs through the rocks on the Crownlands Road Extension. In Cockpit Country, only a few trails penetrate into the interior. Also on the list was an unknown Portlandia a shrub in the coffee family with showy, tubular flowers. The genus is endemic to Jamaica, and all of its seven species are in cultivation. Three years ago, Dowen Grant, one of our collaborators in the Forestry Department, found a burgundy-flowered Portlandia while out doing surveys in the Cockpit Country. At the time, he didn't collect a specimen. Our team wanted to see this plant with our own eyes, because color perception can be subjective. But Dowen has a good eye. It was he who originally discovered the new Cinnamodendron — and it will be named for him when it is published. Buf the rigor of our field demands that all field descriptions be supported by a specimen. In searching for the lost and new species, we covered a vast area, searching localities in the north, east, south and west of the Cockpit Country. Access was via the "ring road," a series of connected roads that bound the p1ateau on all sides. Most of what is known about the flora of this region was documented from localities near this road. There are no paved roads that penetrate into the interior, only a few trails that are traversed by a handful of locals each year. We did have the opportunity to follow one of these paths with the aid of a donkey named Gladys, but we've only scratched the surface. It will take years to fully explore the innumerable hills. I only hope we have the time. Threats loom near from national and international bauxite interests, seeking mining concessions in the region. The Cockpit Country is home to rich deposits of this mineral, used in the industrial procesing of aluminum. ln order to access the bauxite the forest must be cleared and the ground scraped c1ean. Local non-government organizations, headed up by our partners at the Windsor Research Centre at the northern end of the plateau, are working hard to raise awareness among their fellow Jamaicans, as well as the international community, to put pressure on the government and the mining companies. Fairchild's work to document the local biodiversity provides ammunition in this fight. Tagged propagations are ready to be packed up and brought back to Miami. 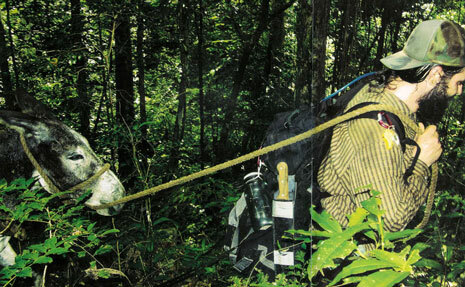 The expedition yielded more than 1,500 herbarium specimens and other plants. In the course of a three-week expidition, with the skilled help of Dowen and several local field guides (special thanks to Rumpy, a.k.a. Steven Palmer), we rediscovered ten of the species we were seeking. An eleventh, Antirhea tomentosa, was subsequently rediscovered by one of our in-country collaborators, Keron Campbell of the Institute of Jamaica in Kingston. We braved poisonous plants, knife-edged rocks, vertical cliff faces and some ferocious thunderstorms, but it was all worthwhile. Armed with new and up-to-date information about the lost species, we can now work with our partners in the Jamaican government to help better protect them. I wish to gratefully acknowledge the assistance we received from the staff of the Herbarium of the University of the West Indies, and especially George Proctor, the world's leading authority on the Jamaican flora, with whom we are collaborating to produce a checklist of the flora. This expedition added about 30 additional species to the checklist and yielded more than 1,500 herbarium speclimens to be distributed among Fairchild, the University of the West Indies and the Institute of Jamaica, plus over 100 accessions of living plants for the Garden. Resulting publications will include the checklist, as well as the new speeies descriptions. We hope to return to The Cockpit Country in the next year to expand our work in this region, and to resume our search for the species we were unable to find. I'm sure there are other new species waiting to be discovered, and much yet to learn about this biodiversity hotspot. The Fairchild expedition team included Lauren Raz, Curator of the Fairchild Herbarium; Jason Lopez, Rainforest Manager; Christie Jones, Curator of Palms and Cycads; Heather Jacobsen, Curator of Herbaceous Monocots; Jennifer Davit, Conservatory Manager; and Kristie Wendelberger, Field Biologist and Permit Coordinator for the South FJorlda Conservation Team. Support for this expedition was graciously provided by National Geographic Society and the Latham Expedition Fund of Fairchild Tropical Botanic Garden.